Thornton appeals 15-game suspension, is he right or wrong? Boston Bruins’ forward his appealing his 15-game suspension. Photo courtesy of ESPN.com. Brendan Shanahan and the National Hockey League’s Department of Player Safety weighed in and suspended the Boston Bruins’ Shawn Thornton for 15-games for his attack on Pittsburgh Penguins’ defenseman Brooks Orpik on Saturday, Dec. 7. We originally thought that Thornton would get around 10 games for his slew foot, sucker punch combination. But the NHL feels that Thornton deserves 15-games, and here is the video in which Shanahan explains the League’s reasoning. As expected there are people who think 15-games is too harsh, mainly those among the Bruins’ faithful like former NHLer Cam Neely, as noted by prohockeytalk.com. But there are also those who think the NHL was not strong enough. Bleacher Report has a good piece arguing this angle. To throw a wrench in the process, Thornton appealed his suspension on Monday, Dec. 17, according to ESPN.com. The next step in the process is a hearing with NHL Commissioner Gary Bettman. But Thornton can appeal to an independent arbitrator if Bettman upholds the suspensions, and there are still six or more games remaining on Thornton’s suspension. We were shocked to read about Thornton’s appeal because we believe he got off lightly with just 15 games. Yes, we know that we wrote that we expected him to get around 10 games – mainly because he has no prior disciplinary history – but let’s be real. 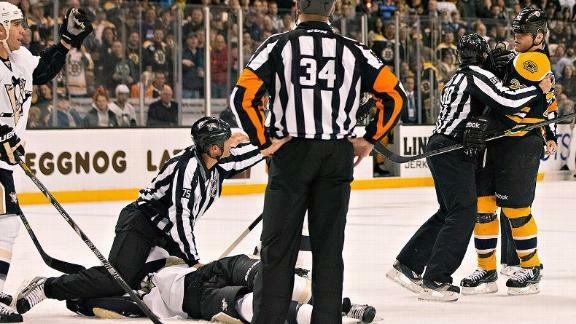 Thornton attacked another player and punched him when he was defenseless. The result was a major injury – memory loss and concussion syndromes – that we hope Orpik can come back from. If this happened in Canada then you could bet your maple syrup that there would be a court case much like the Marty McSorley slash on Donald Brashear and Zdeno Chara hit on Max Pacioretty. Is Thornton a dirty player? No. But he crossed the line and he was suspended for only 15 games. He should be thankful, he should shut up and he should serve his suspension, not appeal it.